These days we are awed by the sheer number of books available to us, and it's difficult to choose something relevant to our needs. As parents, we are limited in the time we can spend reading, and as frugal families we cannot afford to spend on books we may later find irrelevant. So each Wednesday, I aim to review a book on a range of subjects from parenting guides to home-making, fashion/beauty and cookbooks which are most relevant for fabulous, frugal mums! 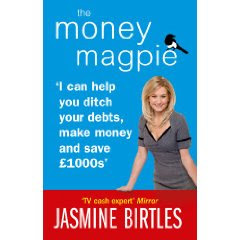 This week I've been reading The Money Magpie: a personal finance guide by TV cash expert, Jasmine Birtles, which has proved a very appropriate read during this time of economic uncertainty! The Money Magpie is a companion book to Jasmine's popular website of the same name. Aimed at anyone who wants to learn more about their personal finances, how to ditch debt and save for the future, this book offers practical financial advice which is easy for even a finance novice to understand. Managing your money and getting rich are not difficult things. In fact, they're pretty straightforward if you have the basic knowledge and are willing to take it gradually. But that's the problem - most of us don't have that knowledge and we get taken in by promises of get-rich-quick schemes. She goes on to explain the confusion many of experience in regard to money-matters since financial institutions and much of the media present personal finance issues in a manner which is not easy to digest. The Money Magpie aims clarify uncertainty in regard to personal finance and does so with an air of humour that makes the whole subject become interesting - and often fun! There are many quick quizzes to help us better understand our current financial situation, what we can do to improve it, and the possible steps we should take in order to reach our goals. In essence, this book intends to open our eyes to the reality of money-matters and work out a plan for improvement based on the truths it reveals. It is a guide which offers information to be tailored to our individual needs with many useful suggestions for improving our financial prospects. Easily digested, this guide is structured into four main "parts", each containing several short chapters which focus on a specific theme. Chapters are broken down further still into many smaller sections. Lists help draw the eye to short, digestible suggestions, while important points are highlihted in shaded portions of text. Possible tasks for investing and making money are organized by their level of difficulty, from easy to hard, offering an overview of the skill and experience levels required to reach our goals. There are few illustrations in this guide, though few are really necessary to break down the text based on the other methods used. This is the type of book which you can just dip into when required, though in my opinion it is best to read from start to end (at least the first time) in order to get a complete overview of personal finance and how it relates to our unique requirements. Part One is titled "Getting the Basics right", and deals with the initial issues we may face with our personal finances. From assessing our current situation though to structuring a basic plan for the future including advice on dealing with debt and ensuring we have the appropriate bank account for our needs. This initial part offers sound advice for those who have very little understanding of personal money-matters. Information is presented for virtually any circumstance and even includes case studies of realistic scenarios (such as a single mum of three living on benefits, and her personal plan to improve her prospects in the log term). Part Two is all about "Smart Spending": how to live for less without cutting back, and learning how to make informed choices about the wants and needs we purchase in our lives. Much of the information in this part of the book covers advice you may have learned about before, such as switching utility suppliers to ensure you get the best value for money, and learning to say "no" to impulse purchases. Saying this, my experience of this book is that such a "common sense" approach is more meaningful when structured and organized, there for us to read in unarguable black and white. There are also some highly interesting sections offering advice I haven't found elsewhere, such as managing finances when becoming a couple, and dealing with cold callers (this one was particularly amusing!). Part Three, Securing your Future, provides independent guidance in regard to saving and investing. This aspect of personal finance is one which causes most confusion, yet through Jasmine Birtle's counsel anyone can easily begin to understand the ins-and-outs of savings, the stock market, pensions and other forms of investment. Key tems are explained in plain English and the lack of baffling jargon is strongly reassuring. What's more, there are plenty of suggestions to ensure we can plan for our own futures according to our personal needs. Part Four, titled Making Money, is all about increasing personal income in our spare time with readily available resources. From participating in online surveys to selling on eBay; monetizing websites and becoming a virtual assistant, there are loads of useful suggestions which anyone can try. In this current financial climate, many more of us are taking stock of our personal finances but are confused about where to even begin, let alone which options we should consider to achieve our personal goals. As mothers, we feel even more inclines to provide for our families and ensure long-term security. I felt The Money Magpie did a wonderful job of de-mystifying all aspects of personal finance - quite a feat for someone like myself (who until recently was relatively clueless in aspects of financial management!). More still, this book provides information in a manner which makes us feel empowered. The case-studies scattered throughout the guide ensure we feel more connected with the information discussed. These examples offer insights as to how "real people" - people like us - can manage money more effectively and plan for the future. While this book is not specifically aimed at families, I find the information provided within The Money Magpie was of great interest and value to me as a parent and strongly recommend this as a must-read for anyone concerned or interested in their personal and family finances and what they can do to improve them. Including interesting and eye-opening quizzes, sound advice and de-mystifying information this guide takes us though the complicated world of finance though baby-steps and helps us to develop a plan of action which is unique for our personal needs. With over 400 pages (and including free downloadable goodies from the official Money Magpie website) I also find this book is good value for money. By following Jasmine's advice we can easily cover the price of purchase in a matter of days and save even more money over the long term. The Money Magpie is published by Vermillion and is aavailable from Amazon.co.uj at the low price of £6.36 . School Uniform for £4.75? The Rumours ARE True! Fill out your make-up bag for less than £10! Read your favorite magazines for free!